Micro-Epsilon has grown from a three-man company to a global operating business group with more than 900 employees worldwide. The family-run, medium-sized company looks back at a successful history paved with technical innovations and continuous growth. Micro-Epsilon offers a worldwide unique range of sensors, measurement systems and customised inspection systems in Europe. An integral part of the company philosophy is to always find the best solution for the customer, which also involves the development of customer-specific products for special environments and installation conditions. The product range of the worldwide operating sensor specialist comprises inductive, confocal chromatic and capacitive sensors, together with laser, eddy current, draw-wire and temperature sensors, including inspection and measurement systems, e.g. for modern 3D surface inspection. The company’s main application areas are machine building and machine design, manufacturing automation and R&D. Continuous development efforts, extensive know-how and a wide cooperation network enable the creation of innovative, high precision products. The sensors of the Lower Bavarian company are used in almost every aspect of life – from an airplane or a mobile phone, to modern computer chips and washing machines. The sensors are helping to conserve resources, automate production processes and to ensure high quality in production processes. The Micro-Epsilon customer base includes world leading companies and major brands in the fields of consumer electronics, smartphones, aircraft and car manufacturers. 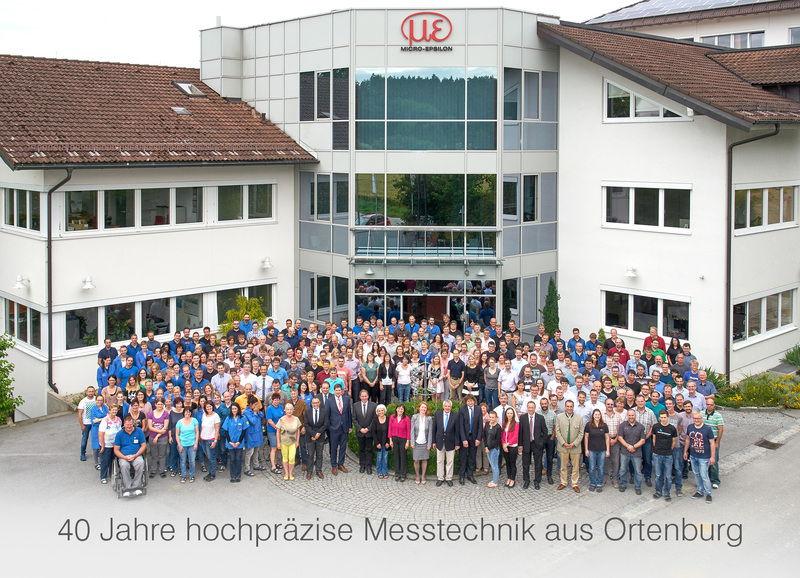 Founded in Hanover as a trading company for strain gauges, the foundation for the in-house development of Micro-Epsilon products was established in Ortenburg in 1976. In the beginning, only a small electronics laboratory existed in the cellar room of a private house. A few years later, the first proprietary company premises were established at the present headquarters in Ortenburg. After many other expansion measures in the subsequent years, a new, large, 4,000-plus square metre facility was inaugurated this year. It offers space for a qualification and test laboratory, a large logistics division with an automatic high-bay warehouse and the administration of the business group with its 23 companies. This creates more space for new ideas while also paving the way for the future at the Lower Bavarian location. In all these years, Micro-Epsilon has not only built up knowledge and expertise but also numerous locations all over the world. Managing Director Karl Wisspeintner celebrates his 40th anniversary this year. During this period, he has set the course for continuous, future growth by his great personal commitment. Furthermore, the fact that Micro-Epsilon has reached today's company size is due to many technical innovations and new ideas from the employees, with which the company has made a name for itself globally. For example, there was a quantum leap in eddy current displacement measurement technology when Micro-Epsilon launched the world’s smallest eddy current displacement sensor in 1988. Up to now, miniaturized eddy current sensors from Micro-Epsilon are unmatched in terms of dimensions, robustness and accuracy. This miniaturization trend combined with highest precision still continues and has to date been a crucial success factor for the company. A current example of success is the confocalDT 2471 HS high speed controller that provides a measuring rate of 70kHz – the fastest confocal chromatic controller with integrated light source in the world. Similarly, the scanCONTROL 29xx-10/BL laser profile scanner has the highest point resolution due to its blue-violet laser line with 1280 points on 10mm. Or the optoNCDT 1320 and 1420 laser triangulation sensors, which are class leading sensors due to their compact design, intelligent signal processing and high measurement precision. What once started as a three-man company has become an international business group. Well-trained technicians form the backbone of the sensor specialist company. Today, more than 900 people all over the world are employed by the business group. More than 300 full-time employees alone work in the Lower Bavarian facility in Ortenburg, as well as 35 apprentice trainees and almost 20 dual students. Thinking of the specialists of tomorrow today, the Ortenburg based company is not only committed to social and cultural concepts but also especially to technological advancement at schools. Micro-Epsilon also offers numerous possibilities from practical work to scholarships and dissertations.